Vernette Allis was born on July 6, 1867 in Elyria, Ohio. Her father, Spencer Franklin Allis was a farmer. He and his wife Elizabeth Kales, had two sons and two daughters. She moved out west to Washinton and on June 28, 1892 she married Maxine L. Longuet in Seattle, King County, Washington. They had a son, Louis Leonard Longuet born 1 Sep 1893 in Seattle, Washington who registered for the draft in both WW1 and WW2 and died January 12, 1958 in Portland, Oregon. In 1898 the little family came to Skagway and Vernette was the first teacher in a little cabin against the hill according to a photo in the Edith Feero collection of photos in Washington. Her Husband, Max, entered the Yukon in May 1898, and presumably she stayed here in Skagway with little Louis to teach. They returned to Oregon after the gold rush and Mr. Longuet died in 1950 and Vernette died on June 1, 1955 in Marion, Oregon. 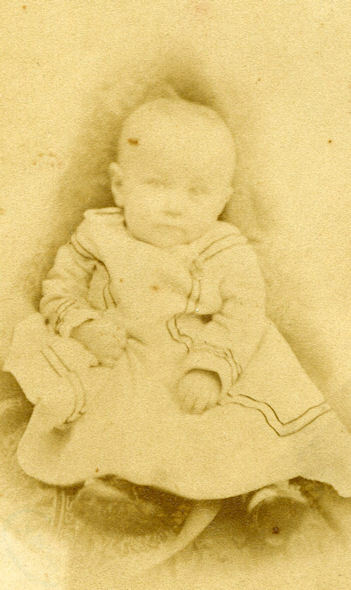 Above is a picture of her as a baby in 1867, hope to find a later pic sometime. She wrote a book called “My trip to Alaska in ’98” which I have not seen, but would be very interesting. 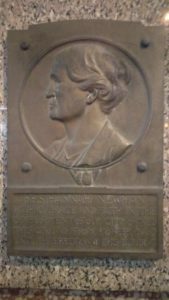 While most of us have heard the story of Mollie Walsh and her great admirer Pack jack Newman, I only just read the curious story of the second monument in Seattle. Mollie met Packer Jack in Skagway where he was smitten with her. He once shot a fellow in the legs right on Broadway so that he could not go up and visit Mollie at Log Cabin where she sold pies. Mollie later married Mike Bartlett who murdered her in Seattle in 1902. In 1930 – 28 years after Mollie’s death Newman decided to honor the memory of his “Angel of the White Pass.” He commissioned a bronze sculpture of Mollie to be placed in Skagway. And here the statue stands today, by a children’s playground that has become known as Mollie Walsh Park. ALONE WITHOUT HELP / THIS COURAGEOUS GIRL / RAN A GRUB TENT / DURING THE GOLD RUSH / OF 1897-1898. / SHE FED AND LODGED / THE WILDEST / GOLD CRAZED MEN. / GENERATIONS / SHALL SURELY KNOW / THIS INSPIRING SPIRIT. / MURDERED OCT. 27, / 1902. Jack Newman was unable to attend the dedication ceremony in Skagway, but sent a message. However, his wife, Hannah let her husband know that she was less than thrilled with his tribute to his lost love. Jack Newman died soon after Mollie’s statue was unveiled in Skagway – on May 4, 1931 of appendicitis. Although Newman had requested that he be buried in Skagway, beside Mollie’s monument, Mrs. Newman had him buried in Seattle. 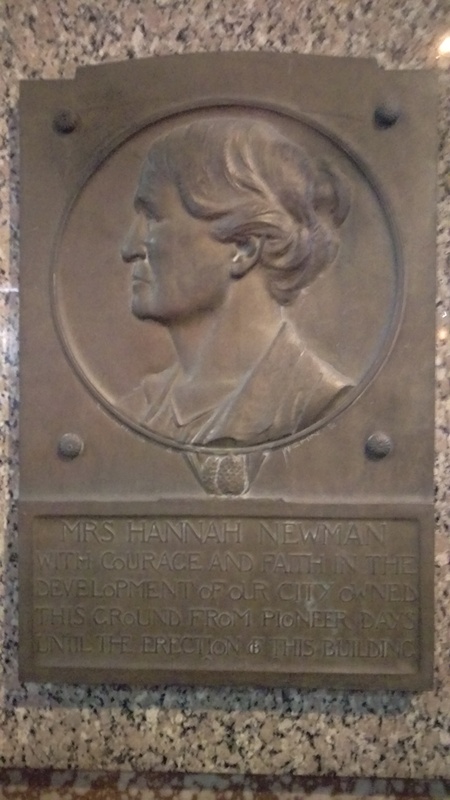 I could not find a photo of Hannah’s bronze on the WAC building on the corner of 6th and Union. If someone would like to photograph it, I will post it, but in the mean time here is a great picture of young Packer Jack. Cute guy! This photo is from the Dawson City Museum and Historical Society Collection and is available from the Yukon Archives for a few dollars. I have always wondered what her story was, certainly she laughs with her wrinkled dress as if she doesn’t have a care. Laugh on Lady – worthy of a bard’s ballad. Mary was a Coastal Tlingit woman maybe born near Haines – probably Klukwan in 1874. I say maybe because her mother was living there and talked to Angela Sidney about Daisy, her granddaughter years later. They were members of the Raven Clan who bore the name Lukaax.adi. Mary is famous because of her husband, Skookum Jim or Keish Mason. They were married around 1893, and Daisy was born June 22, 1895. Jim died in 1916 in Carcross and Mary died on this day, December 28, 1927 in Alaska, perhaps Haines or Skagway. Daisy died only a few years later in Seattle but she was also buried in Carcross with her father. 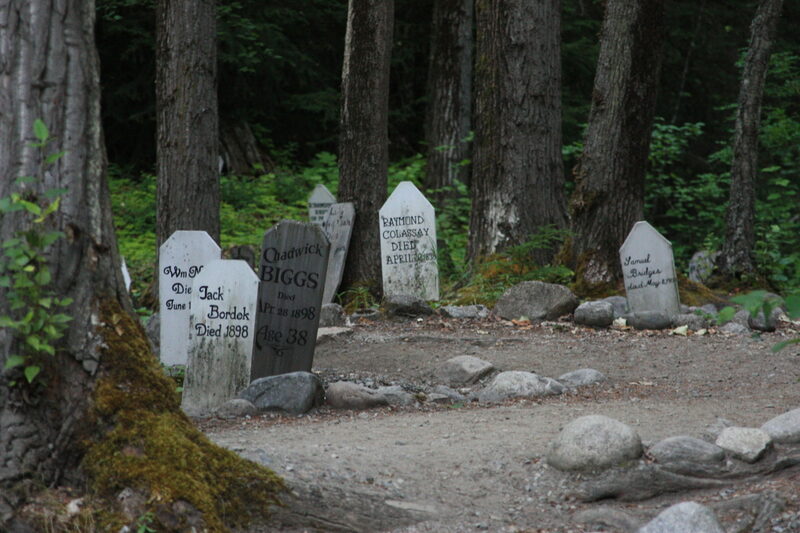 I do not know where Mary’s grave is, I would assume in Carcross also, I will look for it the next time I am up there. The plaque above is in Carcross and was put in in 2000. I saw this great photo on Ebay that sold recently. Other than the date of 1905 there was little information about it, but I recognized the woman in the center as being Victorine Yorba. Looking through my records I believe that the two men are C.W. Ruth and E.L. Wilson who were revivalist preachers at the Peniel in 1905. One could also be the Rev. H. M. Tourney who led revival meetings in the Peniel in 1906. 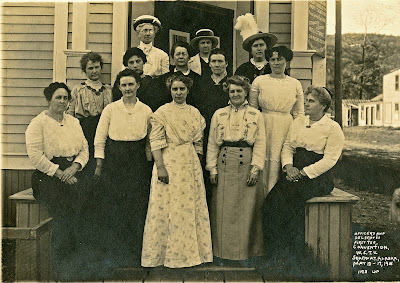 Miss Josie Barnett was also there working in 1905 and I do not know her date of birth so either woman on the ends could be her. Although the ebay seller thought this was at the Presbyterian church, I don’t think so. The interior does not match the Presbyterian Church, but could be the Peniel Mission. The signs on the walls do not match the somewhat staid Presbyterian dogma, but are more indicative of a revivalist clergy. “If God Be for us who can be against us” and “The son of man is come to Seek and Save that Which Was Lost” I can’t quite read the other ones. Also, note there is no altar but rather just a stage as if for preaching and note the extremely large Bible on the right. It’s been awhile since I posted some ladies all dressed up. Wearing black was popular in the Victorian Era to honor Queen Victoria’s widowhood. W.S. Woolever was born on this day, May 17, 1863. Before heading out for the gold rush, he was a partner in a hardware store in Wallaceburg, Ontario, Canada. He caught gold fever and abandoned his wife Clara (Ayres) and his two daughters, Miriam and Yula. The daughters had a brief reunion with him some years later in Seattle at which time, he gave my grandmother Miriam his gold rush journal. For those interested in his journal is presently at the Wallaceburg museum. Between 1901 and 1904 Woolever staked gold claims in the Yukon and actually came away with some profits. During his time here in Skagway, he became an active member of the Arctic Brotherhood. Woolever married Paulina Scott Banks after 1905. When Paulina died in 1927 Woolever met Daisy Banks Haner, also a widow in 1926. They married on August 01, 1927 in Whatcom Co., WA. Winfield Scott Woolever died on May 4, 1945 in Wickersham, Washington at the age of 82. Seen above is his third wife, Daisy with her son Lawrence Haner, born 1912, and taken at their Wickersham, Washington home. Paulina was not the sister of Robert Bruce Banks who died in the fiery explosion of the Clara Nevada here in Skagway in 1898. Many thanks to John Martin for the early history in Ontario, and to Beverly Banks Hammer and Malcolm Haner, grandson of Daisy for setting this story correct! As with all family histories, the true stories lie with the family, not all of which are as stalwart as we would hope. I just try to spotlight the goldrushers for their feats here in Skagway and the Klondike! In the spring of 1915 the Women’s Temperence Movement in Skagway was staging parades and demonstrations to encourage the townsfolk to vote “dry” in the upcoming election. The Daily Alaskan on May 25, 1915 stated that the town had just spent a lot of money to put in new sidewalks (presumably boardwalks) and that without the $4000 in liquor license taxes there may not even be enough money to fund the school. So, the town voted to be “wet” but that did not last for long. On November 7, 1916 the state voted to go “dry”. The saloons were given a year of grace, until January 1, 1918. But on New Year’s Eve, December 31, 1917 the saloons bit the sawdust in every small town in Alaska including Skagway. This was a shock not only to the liquor interests but to everyone who only a year earlier had voted to go “wet”. Of the 16 incorporated towns in Alaska in 1916, 5 had no property tax and depended on the tax on liquor licenses to fund the town. So after that, presumably, Skagway initiated a property tax to fund the boardwalks and the school. Skagway has always been the port for the Yukon and liquor has always been one of, if not the, largest import. I do not know how the Yukoners got their liquor during that decade because it could not have come through here – or could it have? Seen above are the happy ladies of the W.C.T.U. in Skagway in 1915.